Last week, a flurry of news stories reported the real estate listing of a childhood home of Kurt Cobain, the singer of Nirvana (see "Kurt Cobain's Childhood Home...." Sept. 25, 2013, The Guardian.). He grew up in the town adjacent to my childhood hometown, and I recognized the house for sale as one like many other working class homes in the area, small and modest. The asking price however significantly exceeds the property and building value, so some people are obviously attaching more value to this little house because someone lived there who later became famous. This is another excellent reflection of how we construct and re-construct the social meaning of things, places and people (for other examples, see De l'eau Jan. 2012, or Les âmes des vivants et des morts Oct. 2012). The passage of time especially influences how we come to understand and re-imagine certain people's contributions and even the places they passed through. It's a little like this in Aix en Provence, where native son Paul Cézanne was long unappreciated for his art, and his family didn't really fit in as they were seen as interlopers in old Aix society. Cézanne himself was known as a difficult person so that may also have contributed to the lack of enthusiasm for him or his art. Even the early director of the local art museum refused to acquire any of Cézanne's oeuvres for its collections. Today though, Cézanne's image has been significantly rehabilitated. He is often portrayed as the godfather among the artists who came to the south of France or who were inspired by his use of color and landscape themes (see my post Un été en Provence, August 2013 ). His studio, artworks, the sites where he painted, his family's estate, all are cherished parts of this town and renowned tourist attractions. 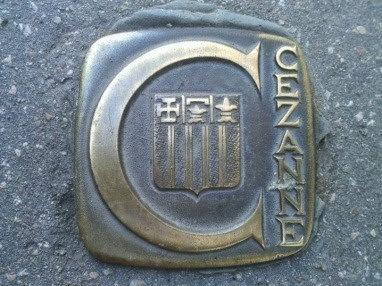 Plaques on walls tell where Cézanne was born, where he went to school, where he died, we know where he was baptised, we can see the signage from his father's hat shop, and his statue on the Rotonde is a good meeting spot. Cézanne fans can even follow his footsteps through town guided by golden plaques embedded in the sidewalks and farther afield, one can walk on trails to his favorite painting spots. The plaques on the sidewalks go right past the building in which my family has lived for nearly two years. For many months after moving here, I wondered what exactly the tourists were gazing at on our relatively plain and modest building. I figured they were misreading their guidebooks or maps as there are two former private mansions with ornately carved doors and elaborate window trims just to the west of us, and the famous French revolutionary Mirabeau's mother-in-law's mansion with its grand gate is situated across the street at the next corner in the other direction. 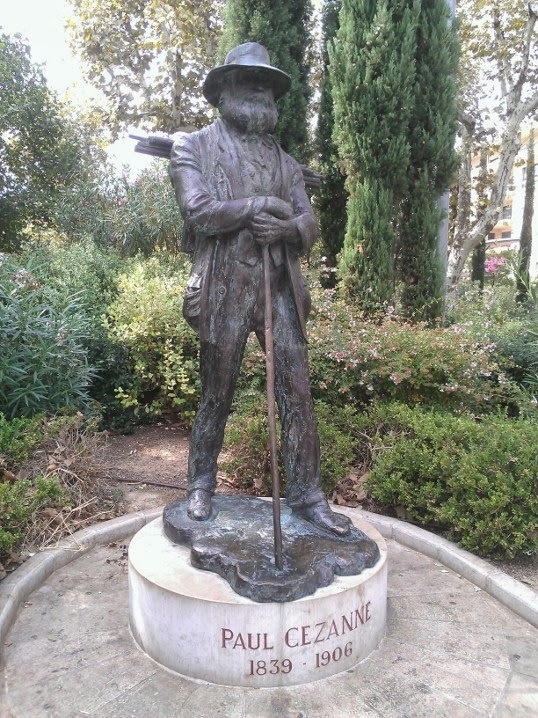 It turns out that we are living in a former residence of the Cézanne family, a detail that is very briefly mentioned on some tourist office information, but not on any signs on the building or street. Even our flat's owner did not know the historical provenance of the building. Apparently, Cézanne's mother owned the building from 1878 and lived here briefly and then gave it to her daughter Rose as part of her dowry in her marriage to a local lawyer, Maxime Conil. The Conils had four children while living in this private residence, so it is very possible that Oncle Paul himself passed some time in the house. Now the mansion has been carved up into multiple apartments and there is no clear evidence that a great artist may have visited or even that a successful Aixois family raised its children here, just like Cobain's childhood home has very few traces of him. Yet, for those of us with broad imaginations, reconstructing what might have happened in a home where someone famous passed through is fun, (it's what museums do for us sometimes too). That the famous person may not have been well-understood or appreciated in his time does not preclude us from imagining that he, on some level, was just like us: he probably looked out these same tall windows in this Aixois mansion, or through the front window of that drafty little Aberdeen house. As a sociologist, this is often enough for me, to imagine the common experiences among people of different times and places. For others, the excitement lies in the further possibility that maybe, by association, some of the creative genius of past inhabitants might rub off on them. After all, where did Cézanne and Cobain get their artistic inspiration if not from what they saw when they looked out those windows--that luminous Provençal light for one, and the gray Pacific NW drizzle for the other? We used to live on the same road as George Orwell which I loved as I admire him and his writing so much. But it's a different matter if the previous inhabitant ws notorious. In fact in England now they often demolish houses where bd things have happened. Maybe there really are vibes!